In this session, we will take a look at some of the new VEX V5 system hardware. 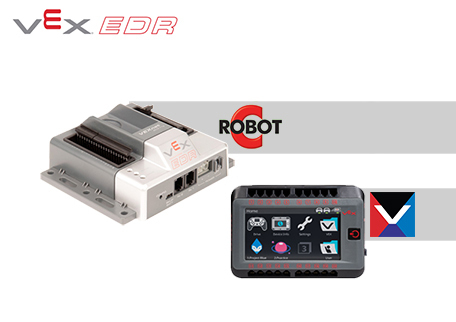 Understanding the enhancements to components like the V5 Brain and Smart Motors is foundational to understanding some of the changes in the new programming environment, VEX Coding Studio. We will also go over procedures such as updating the firmware, configuring Smart Motors, configuring sensors, and downloading and running a basic VEX C++ Program. In this session, we will spend more time understanding how movement programs in ROBOTC text translate to similar movement programs with VEX C++. We will cover behaviors including Moving for Time, Moving to an Encoder Target, Arm Control, and Claw Control. In this session, we will deepen our understanding of VEX C++ programming in VEX Coding Studio. We will cover additional behaviors including Displaying Text, Remote Control, and Moving until Sensor Values. In this session, we will take a look at how your experience with ROBOTC Graphical translates to Modkit Blocks in VEX Coding Studio. Although both languages are block based, Modkit introduces the concept of Event-Based Programming, which we will spend some time discussing. We will cover behaviors around Movement, Displaying Text, and Remote Control.